Before the start the hot topic of conversation in the press corps was what would happen at the first corner. Montoya would almost certainly make a better start than Schumacher. And Michael would slice across the road and cut him out. Ralf Schumacher was hoping that would happen because it would leave him with the opportunity to pass both the men ahead of him. Barrichello was concentrating on making the best start possible because he needed to be ahead of both Williams-BMWs. Ferrari had picked the high-risk three-stop strategy because the team had nothing much to lose. Rubens had to beat the Williams boys and get up behind Michael to allow Michael to let him pass and then ride shotgun for him. Going light should have made that possible. When it came the start was pretty much as expected. Michael cut across to block Montoya, Ralf took a sniff on the outside but everyone came through the first corner in one piece. Barrichello was fourth. In the course of the first lap Rubens showed that he was ready and willing (and running a light fuel load). In a quite awesome maneuver he took Ralf Schumacher with an inside pass going into the daunting 130R. It was a mighty move. The next target was Montoya and at the end of lap two he went past Juan-Pablo with another ace move on the inside at the chicane. "It really surprised me," admitted Montoya. "I pretty much closed him out under braking and suddenly I saw him sliding in, I thought: 'Leave him enough room' and when I came out of the corner, I had better speed than him, I managed to get a good tow out of him and went back in front of him through the first corner. It was good stuff. After that Montoya was able to hold back Rubens and as the laps ticked by one by one, it was clear that Barrichello's hopes of success were fading. "The Williams were very quick down the straight," he explained. "I could not stay ahead of Montoya and I was running my best set of tires." And so Michael Schumacher who had built an embarrassingly huge lead in the first three laps (8.2 seconds) when his tires were new was left to go it alone. "We weren't sure whether these guys were going on a one stop or two stopper," he said. "Seeing the big gap initially, I was wondering if they were on a one stop, but then the times stabilized and as I was about 10 seconds in front. We then remained very consistent." Michael's two-stop strategy was not perfect because on both occasions when he stopped, he came out behind Mika Hakkinen's McLaren and lost valuable time to Montoya. But it was not enough to lose him the lead. "I wasn't able to use the advantage of having new tires," he said. That was basically it. During the first sequence of stops Montoya, Ralf and Hakkinen all led. By the time they got to the second stops only Montoya was close enough to go ahead for a couple of laps but when Juan stopped, Michael went back into the lead. "Today we had a great package and perfect tires," Michael said. Montoya felt that he could not have done much more. "The car that Michael had was way too quick on new tires," Montoya said. "That's where he won the race. When his tires were old and my tires were in a good shape, we were the same or quicker than him. I think we're going to have to work really hard on the tires during the winter to make sure we will be able to run new tires because it seems that if we don't really scrub the tires, we're not competitive." Barrichello's dreams of success disappeared early on and on lap 15 he went into the pits for the first time. 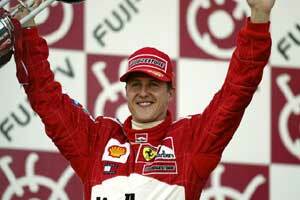 It dropped him from third place to seventh behind Ralf Schumacher the two McLarens and Fisichella. But at the end of the lap Rubens went blasting past Fisichella at the chicane. This became sixth when Trulli pitted on the next lap and as others stopped for their first stops so Rubens moved up to run third by lap 29 when he stopped again. It was back to sixth again until lap 33 when Ralf outfumbled him at the chicane and then Rubens was able to pull ahead on the run down to the first corner. The pits stop sequence rolled around again and Rubens went back up to third until his third stop on lap 41 and that dumped him back to fifth where he ended the afternoon. It was not enough. David Coulthard ended the day third. His was a rather dull day. He was fourth behind Hakkinen until the final laps when Mika pulled over and let him go. It didn't really matter. Mika was just being nice and David did not know it was going to happen. "He's a very quiet chap," he said of Hakkinen. " He doesn't give much away." Hakkinen was thus fourth. "I wanted to give David something back for the occasions in the past when he helped me," he said. Ralf Schumacher should have been ahead of the McLarens but he had a pretty wild race. He had a long first stint and this meant that for a couple of laps he actually led the race but his pit stop then dropped him back to fifth. This became fourth when Hakkinen stopped. Ralf however ran across the chicane once too often after having had an e-mail warning from the FIA®‘ Stewards and this resulted in a 10-second stop-go penalty. By the time he had served his penalty he was back in fifth and then Barrichello took him and he was dropped to sixth, where he ended the afternoon. "The penalty cost me third place," he said. The last man unlapped at the finish was Benetton's Jenson Button. His was a trouble-free race. "It would have been good to have scored some points," he said. Button's team mate Giancarlo Fisichella might have done that because at the end of the first lap he was fifth. But he was pushing too hard and on lap three he had a half-spin which dropped him back to 12th. He was back to seventh in the closing laps when he lost the use of fourth gear and had to retire. "It's a shame to end my last race with the Benetton team that way," he said. The man who will take Fizzy's place next year is Jarno Trulli and he was seventh, a lap down at the end. It was not a great result for Jordan but it was something. "I don't know why we were so slow," said Jarno. At least he finished. Poor Jean Alesi was taken out in a very nasty crash early on when Kimi Raikkonen's Sauber suddenly went out of control and spun. Jean tried to avoid him but ended up sliding into the wall with the Sauber. The resulting accident was a huge one and Jean was fortunate not to have been hit by debris. "Kimi and I were lucky to get away without any injuries," said Jean. "There was no way I could avoid him." The flying wreckage from the accident included a couple of wheels which went across the road into the path of those following and there were some hairy near-misses. Heidfeld came through the carnage and ended the afternoon right behind Trulli. Tenth was Jacques Villeneuve who spent the whole afternoon fighting with assorted Jordans and Saubers. The team press release made a great song and dance about finishing fifth in the Constructors' Championship but it remains to be seen if that is confirmed because the Jordan appeal at Indianapolis is still outstanding. BAR wants to win the battle to be top Honda team this year but we will have to see if that is actually the reality. Olivier Panis was 13th, two laps down. Eleventh place went to Fernando Alonso which was a good effort. The team reckoned it was the Spaniard's best race of the year and it is hard to argue. Alex Yoong continued his learning process and finished 16th in pain because his seat was not quite right and he ended up with a bad cramp. An electrical problem meant that he had started from the pitlane. Heinz-Harald Frentzen dragged the Prost home in 12th after an early collision with Pedro de la Rosa's Jaguar which wiped off the front wing of the Prost. He then spent the afternoon fighting back, overtaking car after car. "This was the toughest race of my career," said HH. "Every lap was like a qualifying lap but I really enjoyed it." Tomas Enge continued his learning process with confusion over starting positions and then a unplanned pitstop when he read the wrong pitboard. After that he had a brake problem which eventually ended his race. The Arrows team finished 14th and 15th and even some of the team members were wondering why they had bothered. Both drivers were given stop-go penalties and power-steering failures.